The FPR100 Series sensors are designed with a one-piece composite rotor, sturdy unibody construction, ceramic shafts, and superior sealing, to provide superior durability and economy. The FPR110 Series, with bright orange spinning rotors provide visual indication of flow only. The FPR120 Series provide visual indication and an adjustable 0.5 amp @ 110 Vac SPDT mechanical flow switch. The FPR130 Series provide visual indication and a square wave pulse output for use with remote ratemeters/totalizers, such as the DPF700 series meters. For panel mounting, all polypropylene units come with mounting ears which accept #8 self-tapping screws; all brass units come with mounting holes which accept #8-32 UNC-2B screws. For all FPR100 sensors, incoming flow can be directed to either port; a minimum of 8 inches of straight inlet pipe is required. Filtration of 150 microns is recommended. Max Pressure: Polypropylene: 100 psig @ 21°C (70°F), 40 psig @ 82.2°C (180°F). Brass or Stainless: 200 psig @ 21°C (70°F, 100 psig @ 100°C (212°F). Max Operating Temperature: Polypropylene: -29°C to 82°C (-20°F to 180°F). FPR130 Power:4.5 to 24 Vdc @ 70mA max. 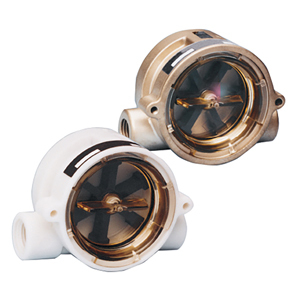 * Low Flow Ranges are only available with use of low flow adaptor (supplied).